It’s almost the end of January as I write this; Imbolc/Candelmas will be upon me in a few days and I was thinking, I ought to write something. I ought to do another Cave post. I ought to celebrate the slow return of the light and the changing of the season. But I’m not going to. Not today, anyway. I may change my mind in the mean time but right now, I’m not going to do it. It occurred to me that it’s nearly six years since I last completed a full-length novel (the third in the Ashurst series) and since then I have limped along with a number of works-in-progress. One is over 60k words long. I had hoped/intended to finish it last year. But every time I thought about opening the document to work on it, I had this sinking feeling and I thought, “Why bother?” and couldn’t find the impetus to start. It’s the same with four other projects. I am so tired, so bloody tired, and I can’t let myself rest. I keep thrashing away, trying to recover my inspiration and energy for writing; I write the odd short story, essay, poem or add a few thousand words to one novel or another. I’m doing corrections for the new novel, after the first proof reader has gone through it; I’ve done around a hundred of the three hundred pages. It’s like squeezing blood from a stone (well, not quite like that; the blood comes from injuring your hand, not from the stone. Maybe a better metaphor than I thought). I keep feeling that if I stop entirely I will never get going again and all the hard work I’ve done to create a writing career for myself will be for nothing. If I let go, do I stop being a writer because I stop writing, or can I be like an actor, who spends time doing other things and calls it resting? And what would I do, what would I be, if I did? I want to rest but I cannot seem to be able to give myself permission. Writer Burn-Out and Other Things. Conjures images of forests devastated by wildfire, of cars reduced to shells of blackened metal and puddles of melted rubber and plastic, of electronics smouldering and going “pouf” before expiring in a spiral of evil-smelling smoke. In the case of a writer, it’s often nothing visible. They just go very quiet. Or they become very noisy, bouncing around social media being terribly cheerful. But there’s a brittle nature to the good cheer, hiding an edge they’re often aiming to conceal at all costs. The edge is a sharp one, a foot sticking out of a shallow grave, ready to trip you up and reveal a horrible secret: you can’t write any more. People suggest tips to get you writing again. Writing prompts, courses, a break away from writing, a holiday, time spent reading instead. I’ll let you into two secrets. The first you may have guessed: I can’t write any more. The second: I don’t think I want to, either. It’s the second that’s the killer. I stopped writing once before, stopped it dead in the water, in 1995. Following the stress of (among other things) trying to do rewrites of a novel for one of the Big Six (as it was then), I became almost fatally ill. Something inside my brain said, “Blow this for a game of soldiers!” and popped. When I recovered enough, I finished the rewriting as requested, waited, and after a committee discussed it, it was dismissed and that was that. Contrary to what I have believed in the years since, I don’t think I made a conscious decision to stop writing. I just…stopped. It became a memory, part of my past, something I didn’t do any more. I think now I shut down the vaster part of my psyche, because I couldn’t face it. I couldn’t face the inevitable failure and loss of hope. You see, me and stories go back a long, long way. Pre-literate me wrote stories, in my head, and used my father’s typewriter to try and get them onto paper. Didn’t work, obviously, but full marks for trying, eh? My whole childhood and teens, I worked on stories. I didn’t do anything much between going to university and becoming a mum, but that was as much circumstances as anything else. My first round of trying to get published, I was in my late twenties. My second round, late thirties. There wasn’t and won’t be a third round. I still believe that self-publishing is the only route for someone like me; on a practical note, now I am in my fifth decade, publishers aren’t generally interested anyway. Youth is what interests most of them. I’m not sure if it’s because a young author has decades of writing ahead or whether they believe they can mould a younger person. But my God, I am TIRED. Tired of trying to do things that I’m not cut out to do, of trying to understand things that are beyond me, and of the entire landscape. Books are mere commodities, nothing more. Or so you’d believe. I don’t. I believe that a book is a holy, sacred thing, a wonder of the civilised world, a joy and a gift. I’ve loved that the e-book means I can carry a whole library round in my handbag, but the down-side is that there are now millions and millions of books out there and no way to easily find ones I might value. It means that good books and great books whose authors (whether self published or not) are not able to do the right kind of hustling, schmoozing, and generally selling of one’s assets now required to get a book in front of potential readers, fail, sink and disappear without trace. Heaven only knows how many beautiful, life-changing gems have gone unseen, their authors losing heart and finally faith. My own did well at first but have started to sink and disappear and the only thing that has even a tiny chance of raising them is to put out more books. I’ve got more books on my hard drive, written in the productive frenzy ten years ago that followed the unexpected return of my mojo. Yet the process of polishing, of editing, of producing a cover, blurb, publicity and so on, daunts me more than it did, because it feels futile. I can’t kid myself that this one might be THE ONE; I’ve done so for each and every book I’ve published, and each time the results have been poorer than the last. The market is saturated and making an impression sufficient to not only generate but also to sustain sales is now impossible for me. I know I have wonderful people who buy and read and love everything I’ve ever put out. It should be enough. But it isn’t. At this point, some are going to be thinking, just take a break, stop for a few months, do something else instead. These are things I have tried. Writing is not only part of me; it’s who I am. It’s so interwoven with my essential being that I will break if it is taken from me, even by my own hand. 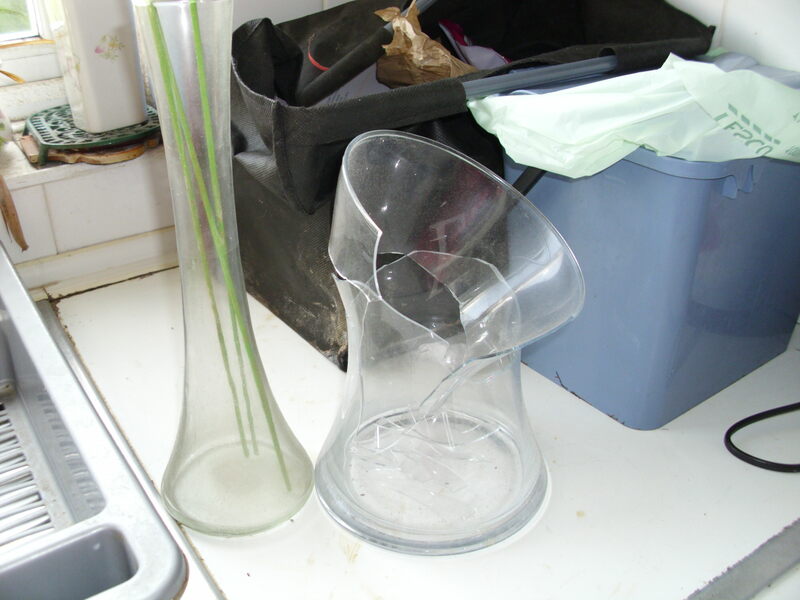 The picture here is of what happened when I stored a long thin vase inside a bigger one; when I came to need the smaller one, the glass had shifted ever so slightly, (glass is a strange thing) and it no longer slid out. In removing it, the bigger vase shattered in my hands.